Republican presidential candidate Donald Trump, during a town hall at Keene High School on Wednesday in Keene, New Hampshire. The autumn of Trump isn’t quite as “high energy” as the summer of Trump. 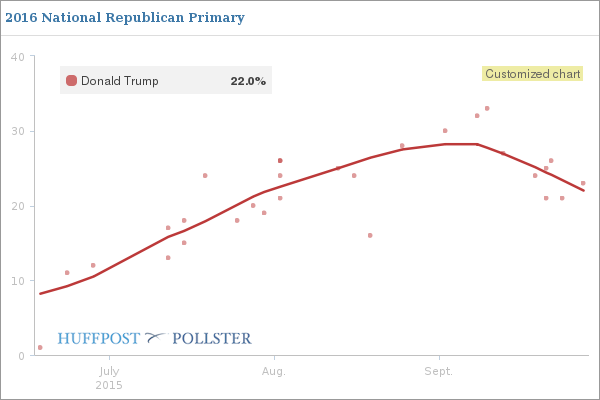 While The Donald continues to lead in most national polls, his support has fallen since the second Republican presidential debate, on Sept. 16. Also, fewer Republicans like him. Trump has 22 percent in the Huffington Post Pollster aggregate of live-interview national primary polls, which is down from 28 percent at the beginning of September. And it’s hard not to see the debate as a turning point for Trump. Every live-interview poll conducted in September before the debate had Trump at 27 percent or higher. Every survey since has had him at 26 percent or lower. What exactly about the debate caused Trump’s numbers to tumble? It may have been the additional exposure of popular Republicans such as Ben Carson, Carly Fiorina and Marco Rubio. But a large part of Trump’s decline appears to have more to do with Trump himself. Trump’s net favorability rating (the share of Republicans who have a favorable view of him minus the share who have an unfavorable view) sits at +13 percentage points, according to the most recent live-interview polls. That’s the lowest it’s been since the beginning of August. 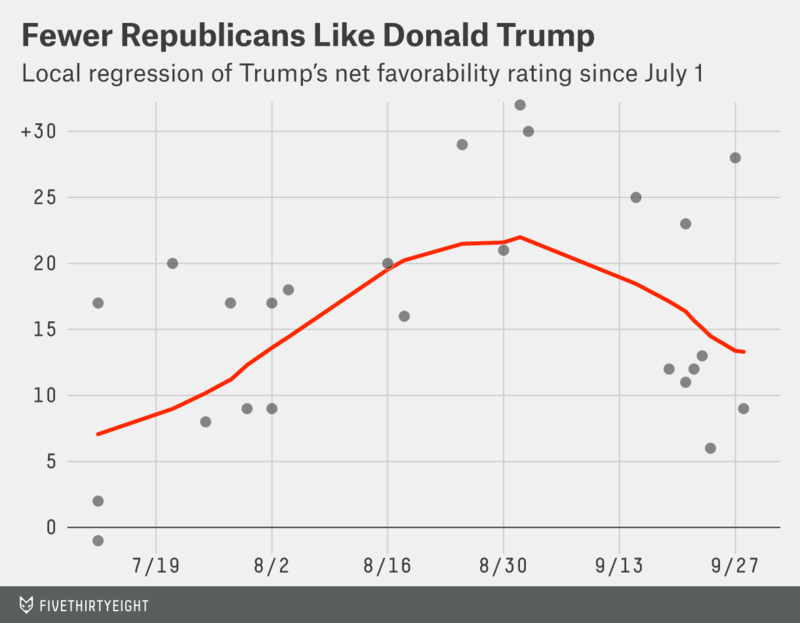 A low net favorability rating lowers the ceiling on Trump’s support. Indeed, in three of the four live-interview polls that asked voters about their second choice since the debate (CNN, Fox News, NBC/Wall Street Journal and Suffolk University), Trump trails Ben Carson when you combine Republican voters’ first and second choices. Of course, Trump’s popularity could improve. It has, after all, gone up before. And campaigns are long; before Newt Gingrich faded for good from the 2012 campaign, for example, he experienced multiple surges. At this point in the campaign, however, Trump’s popularity is far lower than you’d expect from a future nominee. 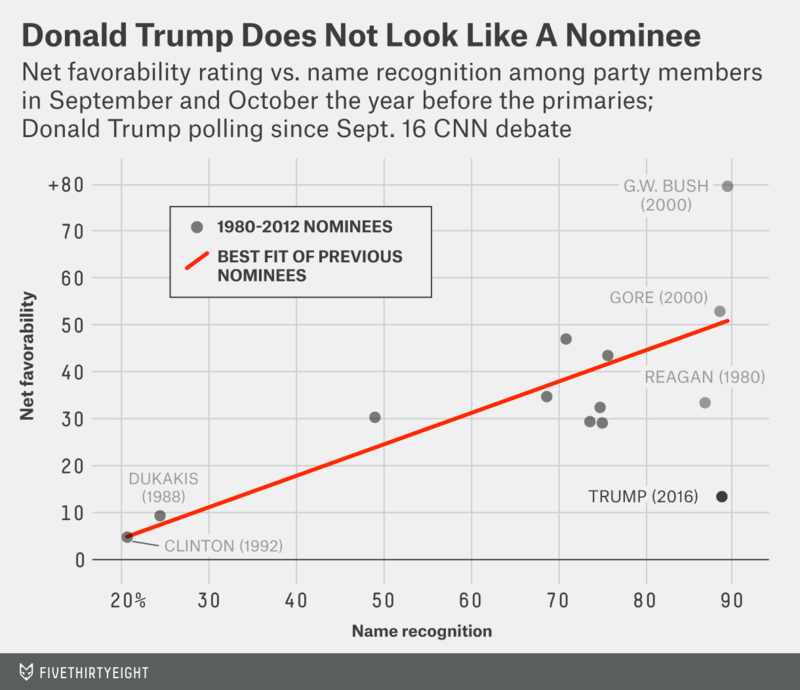 Most nominees (not including incumbent presidents) have either been very popular or not well-known at this stage.1 Trump’s well-known and not very popular. An eventual nominee with name recognition of 89 percent (where Trump has been since the Sept. 16 debate) would be expected to have a net favorability of +50 percentage points, according to a regression of name recognition against net favorability of nominees at this point in the campaign. Trump’s +13 percentage point net favorability doesn’t quite cut it. According to an average of September and October polls from the year before the election.